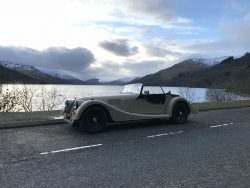 Whether it be a need to blast through the Scottish countryside or perfect car for a special occasion, then hire a sports car from Revolutions for a week, weekend or day. We have a variety of different cars to choose from. You can also hire a number of cars from us at one time. We can let out up to seven cars at one time to groups. These Rates include VAT and Comprehensive Insurance Cover. Additionally, there is a returnable £1000 Insurance Excess Bond taken at the start of the hire. The minimum age for hiring our Morgan is 25 and the maximum age is 70.